European Commission justice and home affairs ministers have approved a wide range of recommendations to EU countries, the European Commission and the bloc’s agencies to act against migrant smuggling. The ministers were motivated by several factors, notably the large number of deaths of migrants and the fact that the business is a lucrative one for organised crime. Meeting in Brussels on March 10, the ministers called on EU countries to accelerate the process of a systematic registration, including fingerprinting of illegally entering third-country nationals and to carry out security checks against various databases. EU countries should phase out non-biometric, non-machine readable identity documents and to update identification documents in line with ICAO recommendations to deter secondary movement within the EU, the ministers said. EU member states should co-operate with the European Commission in ensuring that the collection and exchange of reliable, updated and comparable crime statistics on migrant smuggling is stepped up, notably by extending the existing Eurostat collection of crime statistics to include data on migrant smuggling, with the support of relevant EU agencies, as set out in the EU Action Plan against migrant smuggling. The ministers said that EU states should make optimal use of the information systems in place as well as of public data, platforms and partnerships with social media companies, and all other available instruments to gather, cross check and share smuggling-related data and use these systems for the purpose of predictive analysis of migrant flows and consequent smuggling activities. They also called for various forms of enhanced co-operation, including with Europol and Eurojust. EU countries should intensify financial investigations in migrant smuggling cases for the purpose of gathering evidence, mapping criminal organisations, identifying freezing and confiscating the proceeds of crime of the smugglers and other facilitators involved and to ensure that relevant knowledge, tools and expertise are made available to criminal investigators and judicial authorities who have received specific training, so that investigations into appropriate cases of migrant smuggling can be routinely, and at an early stage, accompanied by multidisciplinary financial investigations. The ministers called for engagement with the private sector, in particular the transport sector, in an EU-wide dialogue to explore existing and develop new best practices, codes of conduct and guidelines in order to prevent migrant smuggling and cope with associated risks, in cooperation with the European Commission. They called for the enhancement of effective and sustainable return of migrants who are not entitled to international protection, for awareness-raising about the risks of irregular migration and migrant smuggling, and a “significant increase” in increase multidisciplinary co-operation within EU countries, cross-border co-operation between member states and EU agencies, and cooperation with third countries against migrant smuggling, “more specifically with Turkey and the Western Balkans”. The EU ministers asked the European Commission to work with EU countries to ensure the effective implementation of the EU action plan against migrant smuggling, and to use relevant financial instruments at EU level “to address the push and pull factors of migrant smuggling”. The Commission should support EU countries in setting up a network of single contact points to foster operational cooperation on migrant smuggling in order to ensure a single entry point and to facilitate cross-border cooperation and exchange of complete and accurate information between member states, and ensure that EU countries strengthen their inter-service co-ordination at national level, the ministers said. The ministers called for enhanced inter-agency co-operation against migrant smuggling, in particular by Europol, Eurojust, Frontex, FRA (the EU agency for fundamental rights), European police college Cepol and the European Asylum Support Office. They said that the EU agencies should ensure that the European Migrant Smuggling Centre (EMSC) can act as the main information hub and coordinating entity on migrant smuggling within Europol, and that migrant smuggling is taken up in existing platforms and units which are set up to fight organised crime, including financial crime. The agencies should ensure that EMSC deploys officers to increase support to member states in need thereof by late spring of 2016. 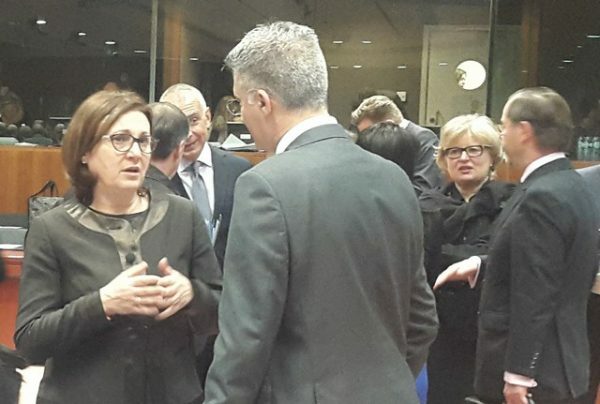 Bulgarian Interior Minister Roumyana Buchvarova, speaking at the start of the meeting, said that she saw recent developments as a good sign towards achieving a uniform Europe and one of solidarity. She said that as part of the EU’s agreement with Turkey regarding issues of illegal migration, Turkey should seek to strengthen efforts to curtail trafficking networks on Turkish territory. Buchvarova said that according to Europol data, nearly 90 per cent of the migrants who come to Europe are assisted by organised networks. According to an Interior Ministry statement, Buchvarova noted the progress made by Greece in relation to the migration crisis and told the meeting that this should be supported not only at humanitarian but also at organizational and logistical level. She also noted the possibility that alternative routes for migration would open up, including through Bulgaria. Buchvarova told the other EU ministers that the Bulgarian government “has taken the necessary measures and is ready to respond if necessary”. Buchvarova said that if routes shifted in this way, Bulgaria should get the same support, in size and nature, that was being given to Greece.